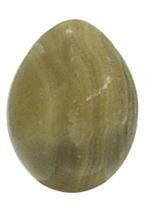 Item #GSE-294: 7.5"x8"x12" Pakistan Onyx egg, bands of Green, Cream, and Brown; 38-40 lbs. 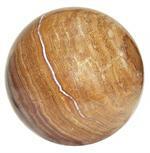 Item #GSE-332: 152mm (6"+) Pakistan Onyx sphere; Butterscotch with Brown, White and Rust Red banding. 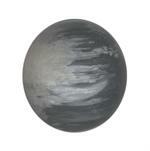 Item #GSE-459: 3 1/4" Banded Onyx Sphere; 1 lb. 14 0z. Item #EG-4: One hundred, approximately 1" tall, assorted natural colors Mexican Onyx Eggs. 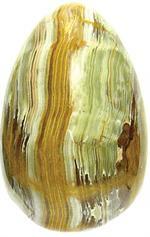 Item #EG-2: Twelve, 1.5"x2" tall, assorted natural colors Mexican Onyx Eggs. 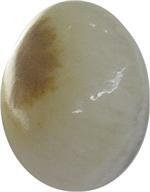 Item #EG-4: Mexican Onyx eggs. Lot of twelve approx. 1” tall in assorted natural colors. 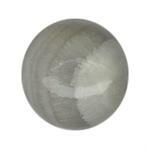 Item #SPHR-1: 1" Round, assorted natural colors Mexican Onyx Sphere. Item #SPHR-1: Twelve, 1" Round, assorted natural colors Mexican Onyx Spheres. Item #SPHR-225: Twelve, 2.25" diameter,assorted natural colors Mexican Onyx Spheres.